I wrapped up my grandmother's tea cup collection and my mother's china, then grabbed a violin I'd hidden way back in my closet that made me cry, a gold necklace with a dolphin that my father gave me two weeks before he died of a heart attack when I was twelve and, at midnight, with that moon as bright as the blazes, I left Chicago. When Jeanne Stewart stops at The Opera Man's Cafe in Weltana, Oregon, to eat pancakes for the first time in twelve years, she has no idea she's also about to order up a whole new future. It's been barely a week since she succumbed to a spectacularly public nervous breakdown in front of hundreds of the nation's most important advertising and PR people. Jeanne certainly had her reasons--her mother's recent death, the discovery that her boyfriend had been sleeping with a dozen other women, and the assault charges that resulted when Jeanne retaliated in a creative way against him, involving condoms and peanut oil. 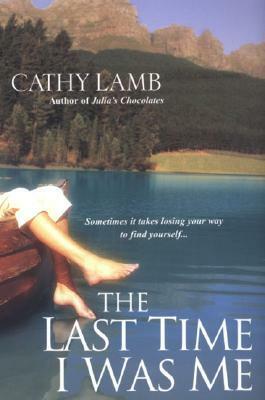 The Last Time I Was Me by Cathy Lamb was not quite what I was expecting, however I loved it and read it any chance I had. This book covers a large number of important issues, but with such humour the reader does not ( or I didn't) become burdened by everything that has happened. I am not going to list all those issues, because to do so may give away some of the plot. There are a number of secrets, and by the end of the book I wasn't sure if we'd found them all out or not! Jeanne is a real character, Brigid Jones on steroids and then double it. The story is revealed step by step, when we meet Jeanne she is moving to Oregon after having delivered a very impressive speech to her advertising colleagues and having also dealt to her cheating boyfriend. The treatment to the boyfriend has led to a pending civil court case, that is hanging over her. The speech has led to no longer having a job in advertising! While she relies on drinking to drown her sorrows, she is still a straight talking woman that I just had to take sides with the whole way through. She has been told by the court she has to take an anger management course which she does when she settles down in Weltana. The facilitator is Emmaline and she takes quite an interesting approach to the group. In the group are two men and another woman, and their meetings and activities take a significant part of the story. As the book moved along I really came to care for these characters. They have all lost an important part of themselves and this group works towards helping them come back to their true selves. As they do this I had the feeling they were forming bonds of friendship that would last a long time. Jeanne is a very intelligent, capable person and thanks to her brother Charlie she becomes the communications person on the Oregon Governor's team as they build their case for re-election. She handles all the speeches and press no problem, also the pest member of the team very ably. If you don't like her already, then her delight in wearing the right pair of shoes for the occasion might do it. As well there is a little romance thrown in that becomes a delightful addition. Loved all most of the characters - so courageous, great writing, loads of funny dialogue, and some serious issues explored. In combination this made for compulsive reading. Oooooh, this looks good! I've read a couple other books by this author, and while the names escape me, I do remember that I really liked them. Yes I have to say I will be reading more, I have one more on my shelf then I'll be looking in our local library. Kathryn, this does sound like a book I'd also enjoy. Terrific review! This definitely sounds like a book I'd love. For some reason it wasn't on my radar before but I'm adding it to my TBR! I have found the three books I have read by her I have enjoyed, this was by far the one with humour. Must carve out some time to read more of Kelly's books! Great review. You are the one who led me to her books!! I liked it, wouldn't be everyone's read I guess, but I inhaled it!